Learn about Salt Spring Island and plan your next visit! Salt Spring Island is one of the Gulf Islands, part of the collection of islands referred to as The Southern Gulf Islands. It is located in Beautiful British Columbia, Canada and is found in between Vancouver and Vancouver Island, just north of the Saanich Peninsula. For information on how to travel to - and around - Salt Spring Island, please see our Getting Here and Getting Around Salt Spring Island pages. So is it Salt Spring Island? Saltspring Island? I have even see it written as Salt Springs Island, Saltsprings Island and Salt Spring Islands! Well according to Canada Post the official name is Salt Spring Island. Whatever you decide to call it, we would love for you to explore what Salt Spring has to offer. How Big is Salt Spring Island? There are around 10500 permanent residents on Salt Spring Island, and this number is reported to double with the influx of visitors in the summer. Salt Spring is roughly 27 km (17 miles) long and 14 km (9 miles) wide, which is 185 square km (74 square miles). It takes approximately 45 mins to drive from top to bottom of the island. Nestled beside and in the rain shadow of Vancouver Island, Salt Spring enjoys some of the best weather in Canada, a microclimate fondly called the "Banana Belt" (read Banana Joe Clemente's article on Banana Belt Gardening). The West Coast of Canada is a temperate rainforest, so Salt Spring can get a lot of rain in the winter, but we get less than the rest of the West Coast - and our summers are heavenly. 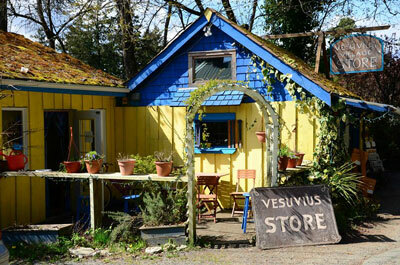 Ganges is the main town on Salt Spring, with an eclectic selection of shops, restaurants, art galleries and attractions. It is centrally located on the east side of the island and overlooks a beautiful marina and the Salish Sea. With the famous Saturday market and array of local goods it's definitely a focal point of the island - but there are many other things to do! Fulford village in the south end of the island has a small selection of great shops, a local grocery store, restaurant and cafes. You'll also find a bike shop, art gallery or two and a little dock to soak up some sunshine. Fulford is where you catch the ferry to Swartz Bay on Vancouver Island. From there you can head to Sidney, Victoria or catch a connection to Tsawwassen in Vancouver. Vesuvius Bay is one of the sunniest spots on the island. With a west-facing beach, the sun warms up the rocks and the sea making it a great place to swim. There is the Seaside Restaurant to get some great fish and chips and The Vesuvius Store for a cup of coffee, tea and essentials. Vesuvius is also where you catch a ferry to Crofton. From there you can head to Nanaimo and a connecting ferry to Horseshoe Bay, explore Duncan, Cowichan Bay and the rest of Vancouver Island. Fernwood is a popular spot in the north-east of the island. 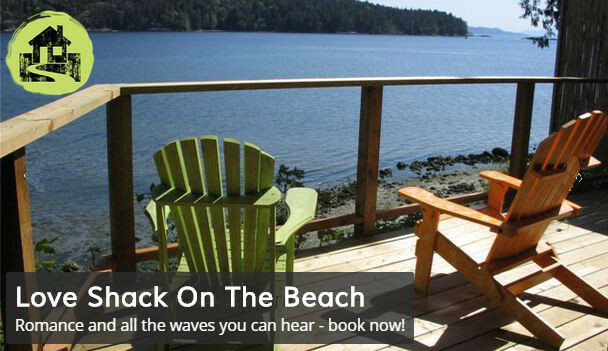 In Fernwood you'll find the Fernwood Cafe, Fernwood Dock and Beach and along North End Road some great little B&Bs with views out over Galiano Island and Active Pass. Learn more about what you can do when you visit Salt Spring including Where to Eat, Local Events, Things to Do and Local Wildlife. You have many options for getting to and around Salt Spring Island - even if you don't have or bring a car. These include cycling, car or scooter rental, taxis and our very own bus service. Visit our pages with all the information you need about Getting To Salt Spring Island and Getting Around Salt Spring Island. Did you know Salt Spring Island has its own Currency? A lot has been written about Salt Spring Island. For more information read this excerpt from "Island of Clear Appeal" by Carl Duncan, distributed by Los Angeles Times Syndicate.